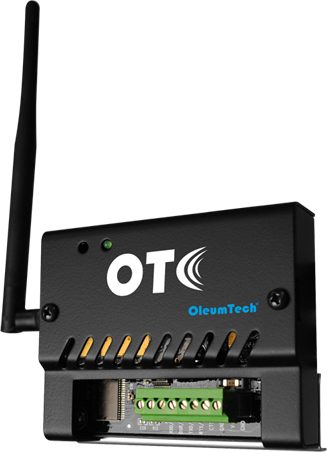 The OleumTech® DH2-W Wireless Gateway plays an integral role in the OTC Wireless Sensor and I/O Network by being able to wirelessly collect critical process data from OTC Wireless Transmitters, I/O Modules, and other Gateways. The collected data is stored in its 1920-point Modbus register holding table. The DH2-W is a full-function Gateway and is ideal for fitment where enclosure space is a premium. When it is deployed by itself, it can be installed on a DIN rail having less than 1-inch width of space. 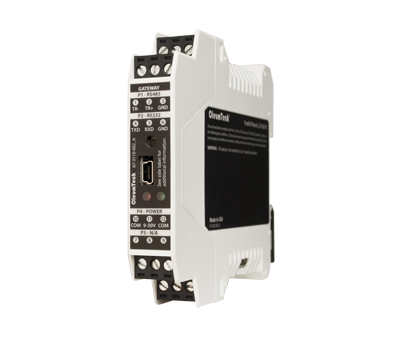 The DH2-W can be configured as a Modbus master or slave device and provides RS232/RS485 connectivity. In the OTC Sensor Network, multiple Wireless Gateways can be placed into the same network to form a much larger sensor network. All Gateways can have their own set of transmitters and they have the ability to communicate with other Gateways in the network. With this powerful advantage, you can setup sophisticated I/O distribution systems and migrate data with extreme flexibility, scalability, and ease. OleumTech offers isolated 0-10 Vdc, 4-20 mA, and Digital I/O Expansion Modules for use with the DH2-W for solving various I/O challenges. The I/O Modules can be used in any mix or combination with the DH2-W. The BreeZ® Software makes it extremely easy to add and configure I/O points. A standard 35 mm DIN rail is required for I/O Expansion Module(s) integration.